Argentine striker Emiliano Sala was on board a small aircraft that disappeared Monday night, This sparked an extensive search operation covering approximately 1,700 square miles around the Channel Islands, a statement issued by Guernsey Police from harbour master Captain David Barker confirmed the active search had been abandoned after his team had been ‘unable to find any trace of the aircraft, the pilot or the passenger’. Sala had only just joined the Premier League side become Cardiff’s record signing from French side Nantes, where he played against World Cup winner Kylian Mbappe in Ligue 1, joining Neil Warnock’s side for a club-record £15m move. A brief message from Mbappe, who finished fourth in the 2017 Ballon d’Or, was shared on the 20-year-old’s Twitter account showing a prayer emoji alongside a picture of the pair in action – with the young striker joining the many hoping for positive news regarding Sala. World Cup great Thierry Henry also tweeted his support, praying for good news about the young striker. 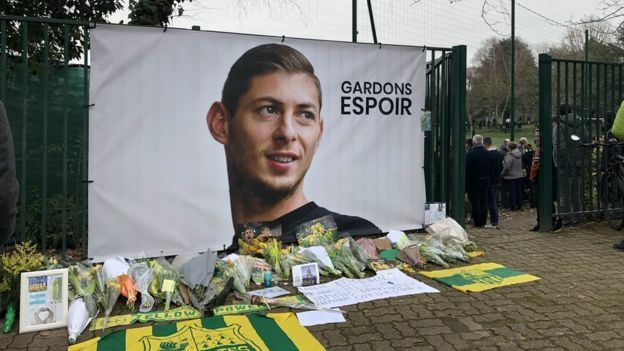 Devastating news about Emiliano Sala. Wishing and praying for strength, courage and some good news for his family and friends. 28-year-old Emiliano Sala, who began his career with Bordeaux, boasts a record of 12 goals in 16 Ligue 1 matches this season – putting him fifth in the league’s scoring charts behind PSG trio Mbappe, Edinson Cavani and Neymar as well as with Lille winger Nicolas Pepe. After sealing a move to Cardiff at the weekend, it is believed Sala returned to Nantes to say goodbye to his former team-mates before joining the Premier League side for training this week. Clubs, including Tottenham and Leicester City, have also expressed their best wishes and support to Cardiff. In a statement posted on Cardiff’s official website, Cardiff City owner Vincent Tan who offered his thoughts and prayers to the family of Emiliano Sala said: “Monday evening’s news shook everyone at Cardiff City FC to the core. “I’m very confused. The only thing that I want is that my brother and the pilot be found. “We ask them [the authorities] to put themselves in our place, in the hearts of the relatives.